Gold Tube Lock for #13 Thick Tubes. #13 Thick Moisture Free Tubing with Gold Tube Lock installed. #13 Thick Moisture Free Tubing with Silver Tube Lock installed. Plastic Lock for InvisiLock assembly. For soft earmolds. #13 Thick Tubing with Gold Tube Lock installed. #13 Thick 'Vibrant Color' Tubing with Gold Tube Lock installed. #13 Double Wall Tubing with Gold Tube Lock installed. #13 Thick Tubing with Silver Tube Lock installed. For soft earmolds. Features the pressure-fit retaining flanges of the patented Tube Lock Plus, but without the external positioning flange. 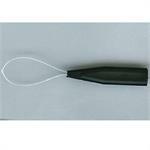 For easy insertion of tubing through any earmold, use the handy nylon loop Tubing Puller. For drilling or enlarging earmold vents and for removing old tubing from bores. Comes with 2 chucks that fit bit sizes .031, .062 and .094. This tool temporarily expands the tubing to make it easier to slide onto any type of accessory, attachment or connector. For the easy installation of our Tube-Lock coupling system.